The proper delivery of vapor and liquid feeds to mass transfer devices is essential to the successful operation of mass transfer columns. 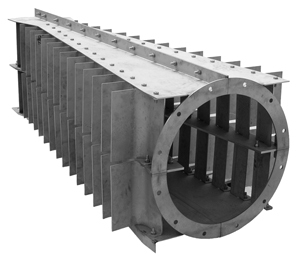 AMACS offers a complete compliment of feed inlet devices to accommodate every possible configuration including intermediate feed, mixed phase feeds and foam suppression. 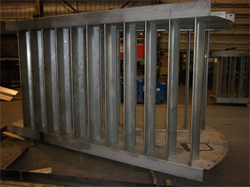 We specialize in fast delivery in towers up to 20 feet in diameter and with tray decks up to 1/4″ thick in common stocked alloys of CS, 410ss, 304Lss, 316Lss and Monel 400. Our AccuFlow product is a high performance inlet diffuser for maximum efficiency in the disengagement of vapor and liquid. This device will correct flow imbalances and improve the operation of separators and distillation columns. It is used extensively in vacuum and packed column service where vapor distribution to the packed bed above is critical. 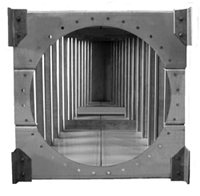 A V-Baffle diffuser is used in high-pressure services or trayed columns. 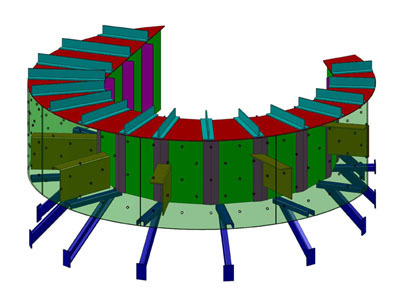 It is an impingement device that divides a mixed phase feed evenly and directs it around the column shell for excellent momentum dissipation and vapor/liquid separation. 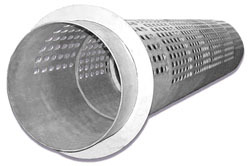 The perforated, or half-pipe configuration, of a pipe inlet diffuser is used to uniformly distribute a vapor feed to the tray or packed bed above. This device may be a straight pipe or have a ladder pipe configuration. The Vapor Horn or Hood is another device commonly used in crude vacuum towers to provide vapor distribution to the bottom of a packed bed. It is an annular device that wraps around the column wall with an opening on the bottom but closed on the top and side. This provides a mechanism for the vapor and liquid to disengage as it swirls around the column. The liquid drains to the bottom of the column and the vapor escapes around the sidewall and heads up the column.